Two days ago, I finished playing Brothers: A Tale of Two Sons. Even before I finished the game, I felt like I wanted to write an article about it. After it ended, I needed some time to recover my emotions, but I knew that this game deserves a close look at its design. 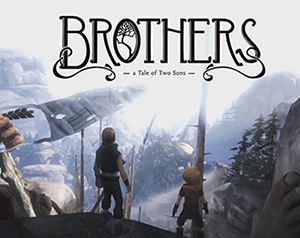 Brothers: A Tale of Two Sons by Starbreeze Studios. Brothers tells the story of two brothers who go on a journey to find the tree of life in order to save their dying father. You control both characters simultaneously, in a unique single-player co-op control scheme (a controller is required). The game takes full advantage of its unique controls by incorporating them into the story and emotional development of the characters—and of the player. 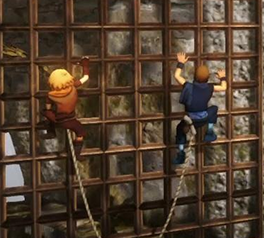 This article contains heavy spoilers for Brothers: A Tale of Two Sons. Play the game first. Seriously. Play the game. It’s amazing, especially from a design perspective. 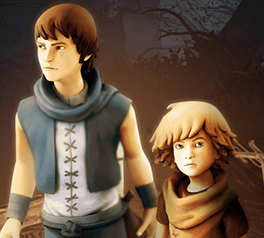 Pick up Brothers: A Tale of Two Sons on Steam here. Lots of games today are more like movies with some added interactivity. Even nonlinear games with branching plotlines often tell their stories through cinematics or boxes of dialogue. 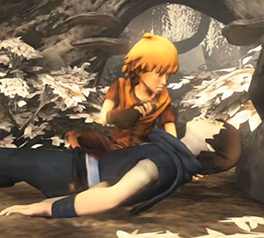 Brothers breaks that tradition by telling the most important parts of its tale through the gameplay itself, drawing the player personally into the most emotional parts of the brothers’ adventure. Starbreeze Studios has succeeded in making a game that truly embraces being a game. Brothers cannot be told in a movie, or a book—the player’s emotional investment comes directly from the gameplay, which is a beautiful achievement and one that is rarer than you’d expect in the world of game design. Big bro and little bro. Sure, it has a couple of cutscenes here and there, and the story isn’t particularly deep. But it is incredibly emotional—and while the journey doesn’t present a complex plot, the depth of the emotions makes it one of the best and most memorable gaming experiences that I have ever had. So how did Brothers accomplish this method of gameplay-based storytelling, and what can we learn from it? The core mechanic of Brothers is the way in which you control both characters at the same time, with the single controller. One joystick controls the older brother, and the other controls the younger brother (but I don’t need to explain this, because you’re not reading this article until after you’ve played the game, right?). The player becomes emotionalyl attached to both of the brothers because he needs to use them together in order to progress through the game. Sure, that can be said of any games with characters. But the unique control scheme enhances the relationship between the two brothers. The player—you—physically become that relationship. You don’t play as the older brother, with the younger brother as a sidekick. You don’t play as the younger brother, following the older brother. You play as both. The game design gives each of them important roles in their adventure. But that’s not the cool part—what blows me away is that while you control both of the characters, you actually represent the bond between them. With one hand controlling each boy, it’s you who makes the bond that holds them together. It’s you who fills in that gap. You don’t simply control two characters in Brothers; you physically become the relationship between them. It’s a genius and novel approach to involving the player in the game, and it’s made possible by the control scheme. It’s also quite meta—in the good way. Even though they don’t speak English (or any other recognizeable language), and there are no boxes of text, and the cutscenes are few and short—you feel incredibly invested in the characters. Because you are the bond between them. You control both brothers simultaneously. Your role as the bond between the brothers is put to the test in the final act of the game. The ending lays on the heavy emotions. When the older brother dies (hey—I warned you multiple times about spoilers), you feel it physically. When I saw the older brother’s body was lying on the ground, I wiggled his control stick and repeatedly tapped his action button—to no result. He just lay there, dead, and the controls reflected it. It hurt. That’s when I shed my first tear (yeah—this game made me cry). Not when he first died in the cutscene, but when I felt his death in my own fingers. Half of the controller dies with him. It suddenly feels empty to control one character and not the other—an emptiness that echoes the mourning of the little brother. The younger brother’s side of the control stick is the right side—the joystick that most games reserve for camera controls (if they use it at all). It almost feels wrong to be controlling your character with that side of the controller, a feeling that is amplified by the simple lack of input on the big brother’s left side. It’s another fantastic meta touch that enhances the emotions of the moment. It works on a level that you likely don’t even notice—but you notice that the world feels different and it breaks your heart. Early in the game, I found a flower pot. When I interacted with it as the older brother, he enjoyed the flower’s fragrance. The younger brother, on the other hand, gleefully smashed the pot. There are lots of little interactions like this in the game; the older brother helps someone brush the ground in front, while the little brother playfully balances the broom on one hand. When the older brother looks down a well with curiosity, the younger brother instead spits into it. These small interactions do a wonderful job establishing the character’s personalities—how they see their own roles in the world and how other characters react to them. It also highlights other elements of the characters—when you approach a harp, the older brother can’t hold a tune, but the younger brother plays a beautiful melody. Through small actions, we learn more about these two characters than we could with hours of text. At the end of the game, after the older brother met his end, I encountered another flower pot. When I interacted with it as the younger brother, he didn’t smash it. Instead, he stopped and smelled it—with an animation similar to the older brother early on. He grew as a person. The journey, and the loss of his brother, changed him—forced him to grow up. No longer is he the child who laughs at causing mischief. Now he—literally—stops to smell the roses. A trait that he picked up from the time spent with his brother. It was beautiful. And without a single word. I cried. Ain’t no shame in that. The little brother’s development goes further than that. The final puzzles of the game are brilliantly designed in a way that asks the player to remember everything that has come before. Early in the game, it is established that the little brother cannot swim, and you need to hold his action button to hang onto the big brother’s back. At the end, little brother is alone. When faced with water, he initially hesitates. He could never swim before. At first, it seems like you can do nothing to progress. The little brother’s action button does nothing. But then you try the other action button—the one that symbolizes the older brother—the button that has been tragically empty since his death. And the little brother finds the strength to swim on his own. This is the moment where I began to cry again (and didn’t stop until the credits). The same solution is repeated for the final puzzles. The design of the last moments of gameplay is beautiful—it is the same area that the game opened with, when it served as an introduction to the mechanics. Originally, these puzzles need to be solved using the older brother to push a lever or give the little brother a boost. Now, the surviving brother finds the strength to do these actions on his own, but he can only access that strength when the player urges him to recall the connection to the older brother. Again, the player’s role as the relationship is the key to the emotion. When you press the action trigger associated with the older brother, you call upon their bond to give the little brother the strength that he needs to see their journey to its end. It brings everything together. The older brother may have fallen, but the younger brother carries his strength now. Over the course of the depressing adventure, he’s grown tremendously, from a mischieveous boy into a determined young man. And because of this development, the ending of the game leaves you feeling triumphant despite being overwhelmed with grief. And it’s done entirely through the gameplay.